A controversy that could only unfold in B.C. A plan by the province to close Vancouver's Burrard Bridge for free yoga has collapsed after corporate sponsors spooked by backlash withdrew from the event on Friday. Shortly after B.C. 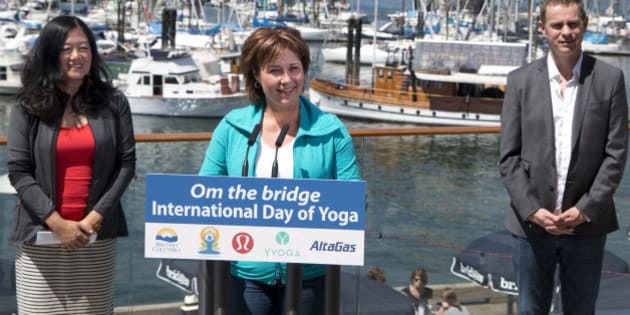 Premier Christy Clark announced on Friday that she wouldn't be attending the government event, Lululemon, YYoga, and AltaGas all pulled out from the celebration for the International Day of Yoga. "Our intention to provide yoga to the city in celebration was purely formed. We hoped that our intentions would shine through, but that has not been the case," said a statement from YYoga president Terry McBride. "We have heard that the event that was presented was not what they wanted." He said the company still wants to do something to "reflect the tradition of yoga," but it will be in a park. @stromkonsult After much feedback, we've decided not to participate. We'll be reimagining a way to honour the spirit and tradition of yoga. In one week, the provincial government's plan to shut down the Burrard Bridge on the morning of June 21 quickly spun into a controversy that could only unfold in B.C. Critics lashed out at Clark for spending $150,000 on planning and security, as well as allowing corporate sponsorships of the event, which coincides with National Aboriginal Day. Yoga Day is a great opportunity to celebrate peace and harmony - it's not about politics. I don't intend to participate. The decision came one day after she thumbed her nose at the backlash via her Twitter account. The premier issued a statement on Friday afternoon, saying: "Unfortunately, the focus of the proposed Burrard Street Bridge event has drifted towards politics — getting in the way of the spirit of community and inner reflection. It was for that reason, I decided not to participate." She continued, "Though we are forced to cancel the Burrard Street Bridge event, I hope British Columbians will still feel encouraged to participate in their events elsewhere." The president of AltaGas, which had pledged $10,000 for the event, told CBC News it would likely follow the other sponsors in bailing out, reported CBC News. Canadian entertainer Raffi had called for a boycott of the event, while other critics organized a rally to "crash Christy Clark's yoga party." One group on Facebook called for people to "use all the event infrastructure paid for with tax money for what it should have been earmarked for in the first place: National Aboriginal Day." Vancouver Mayor Gregor Robertson has already confirmed he would not be attending the yoga session, and will instead be at celebrations for National Aboriginal Day, reported CBC News.